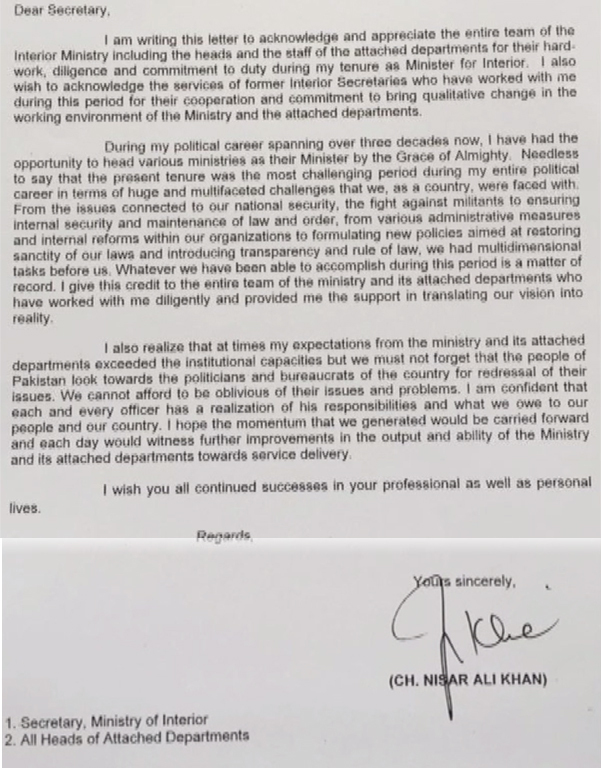 Chaudhry Nisar Ali Khan wrote a farewell letter to Ministry of Interior Secretary on Monday, praising his services. He acknowledged the numerous challenges faced in the tenure and called it amongst the toughest times. The ex-interior minister praised Arif Ahmed Khan for his resilience since the very start. Ch Nisar said that the present tenure was the most challenging in his entire political career of over 30 years in which he led various ministries. The main challenges that the ministry faced included militancy, national security, maintenance of law and order, and constituting new policies.